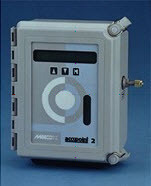 The WaterBoy 2 offers a cost-effective “on-the-go” solution for reliable, portable moisture analysis. Its modular design and sturdy construction is ideal for natural gas field conditions. It comes equipped with an internal rechargeable battery, in addition to a 120 Vac transformer or a 100-240 Vac universal transformer.The WaterBoy LP2 is available for sample gas inlet pressures below 100 psig.